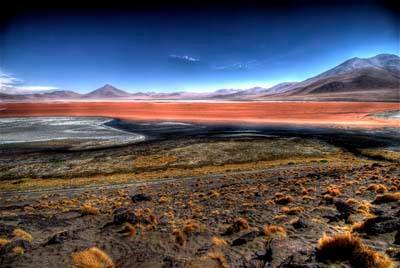 THIS TRIP CAN ALSO BE DONE STARTING IN UYUNI OR SAN PEDRO DE ATACAMA FOLLOWING THE SAME ITINERARY IN REVERSE. 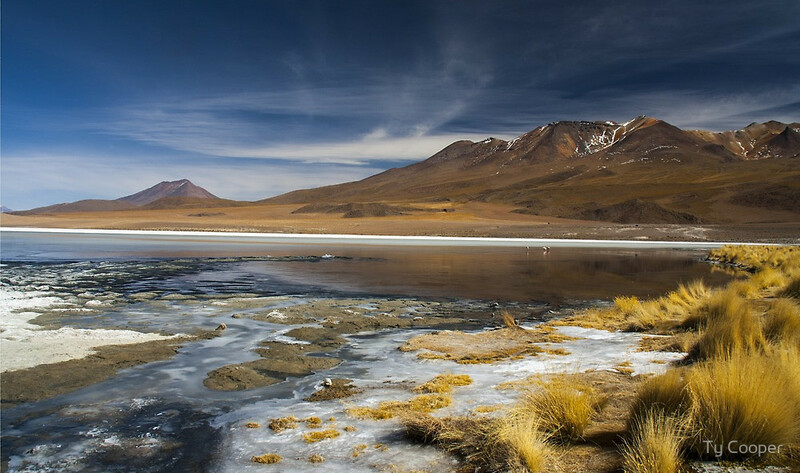 Join us on this exclusive 4WD Andean expedition as we travel from the city of La Paz to the country’s first national park Sajama – one of Bolivia’s best kept secrets – and then traverse not one, but two magnificent Salares (Salt Flats) the smaller, but equally beautiful Salar de Coipasa and the incomparable Salar de Uyuni before we head south to the remote and stunning southwest region where some of the most remarkable landscapes await, such as Laguna Colorada with its thousands of pink flamingos, Laguna Verde at the foot of impressive Volcan Licancabur, striking deserts, idyllic hot springs, steaming geyser fields and all the great attractions of the already popular 3-day Uyuni Salt Flats tour. Leaving Sajama National Park on our second day, drive along dirt roads abundant with herds of llamas, alpacas and vicuñas across the vast Altiplano (high plain) en route to Salar de Uyuni. It is a long travel day, but full of surprises along the way. Drive along rugged and snow-capped mountain ranges; get to see traditional villages and picturesque archaeological sites before enjoying lunch around noon. Continuing our drive through the Altiplano, get your first taste of flamingo-filled lagoons, and traverse the country’s second largest (but lesser-known) salt flats: Salar de Coipasa before reaching your accommodation in a small village located on the northernmost tip of Salar de Uyuni at the end of the day. Enjoy sunset and spend an evening at leisure. Today, take in the wonders of the world’s largest salt flats for an entire day. Begin by witnessing a striking sunrise on the Salar. A full day is then spent exploring as much of the 12.000 km2 of salt as it is possible. Highlights include hiking on Isla Incahuasi – a rocky outcrop covered in ancient coral rock and giant cacti – which provides us with an excellent base for a moderate hike and beautiful views of this white sea. Visit a former salt hotel and take your time get creative with your camera (bring your props along) to take advantage of the depth illusions created by the endless white of salt which result in fun photography to show those back home.